Since Halloween is creeping up, I thought it’s about time I did something for my fellow Truebies hoping to throw a cool party and looking for ideas. There is, of course, the real deal Tru Blood which is no longer sold by the HBO store but still available on Amazon. But most of us are humans and humans would never drink Tru Blood. No, we get high on V.
For the uninitiated, V is vampire blood, usually obtained through unpleasant means such as strapping a vampire down with silver chains and draining him to sell his blood like crack. It greatly enhances humans briefly and is highly addictive. Lafayette can explain it to y’all better than I can though. First of all, I don’t recommend you make this to give out to kids on Halloween because you’ll probably get a visit from the cops later on. This is best reserved for parties with fellow Truebies or people who just love Halloween in general. I brought these to our Halloween potluck at work and they were a huge hit. The first thing you’ll need to do is buy supplies because you probably have to get these shipped to you. The ingredients you can just buy anywhere. Now, Lafayette probably uses 1 dram vials, but they’re too tiny to serve to people, so I like the 4 dram size. This past weekend at Costco I bought a bag of frozen strawberries and a bag of those mixed berries as well. The mixed berries has blueberries, raspberries, and blackberries. I had to experiment with the berry ratio until I got a good color and I found out that if you use mostly strawberries, it turns out a little too pink. So I tried again and used mostly the mixed berries. Scoop out about 2 cups of the mixed berries and add a few strawberries. Let it fully defrost, as you won’t be able to get much out of it if it’s frozen like a smoothie. Once defrosted, throw it in your blender and puree until blended well. Cut out and layer 4 sheets of cheesecloth in your Pyrex measuring cup (you’ll need the pouring tip later). Pour a bit of berry mixture in. Looks disgustingly bloody, doesn’t it? 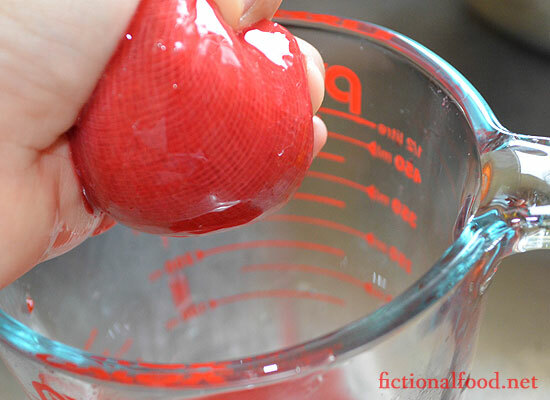 But it’s got seeds in it, so now we gather the cheesecloth and form a “ball” and begin squeezing the berry juice out. It looks so gross, I know. Like I’m squeezing a maxi pad out. Ewww! 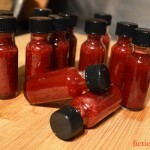 Anyway, you should end up with about 1 cup of really thick berry juice without seeds. Add 3 tablespoons of sugar and mix it up. 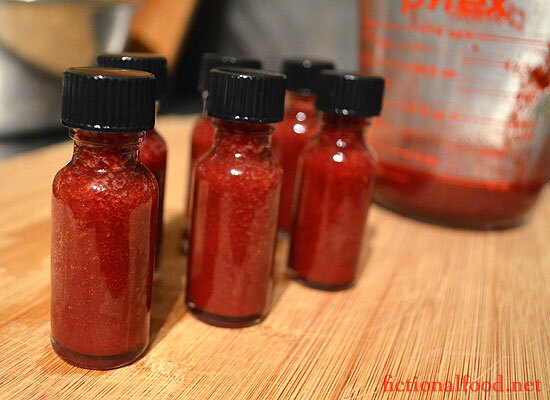 Pour the sweetened ‘V’ into your glass vials (after you rinse them!). Unfortunately, mine had bubbles, so I recommend letting it chill in the fridge for a bit before you bottle them. After that, just chill them and serve. 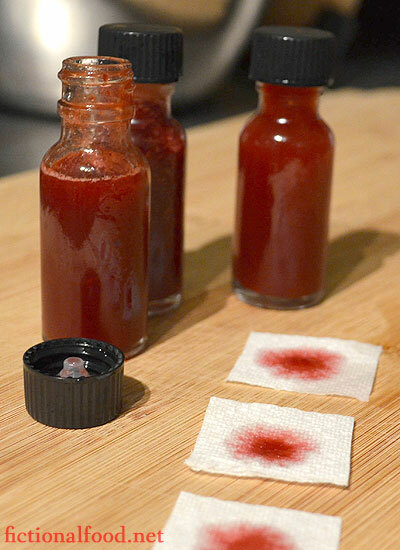 If you’re not doing this with a True Blood theme, you could stick little labels on them that say things like “O negative” or “B positive”. Here’s a final close-up. Recipe follows this post. Do NOT serve to vampires! 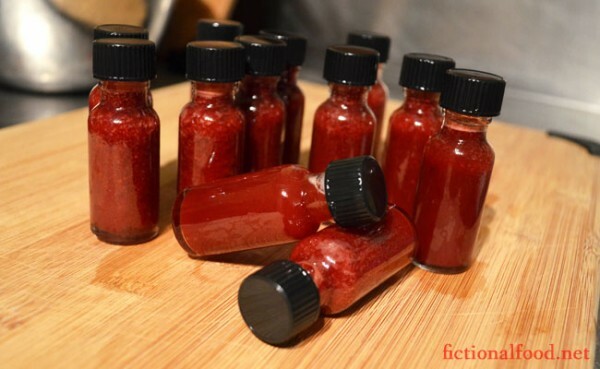 Make vials of vampire blood to serve to your human guests at a party. 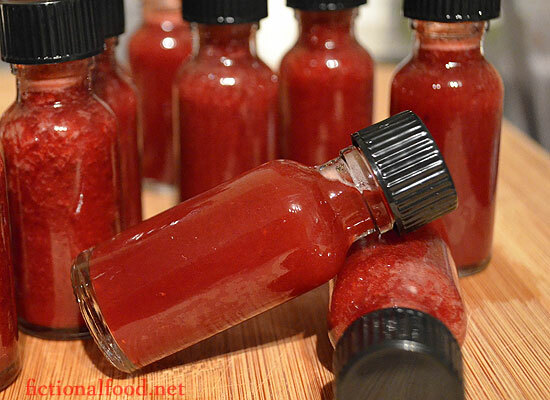 Put defrosted berries into blender and puree until smooth. 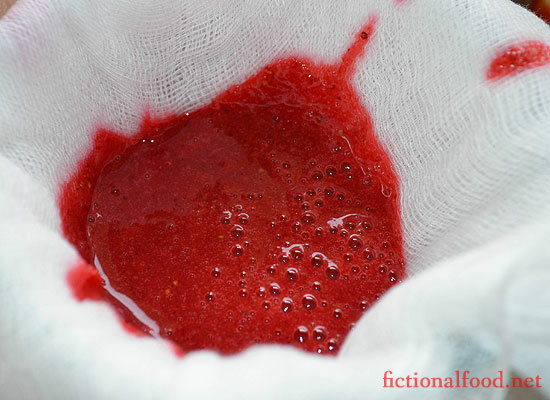 Layer 4 sheets of cheesecloth and squeeze berry juice through, washing out the cheesecloth and seeds as necessary. Add sugar to taste, starting with 2 tbsp and adding more as needed. 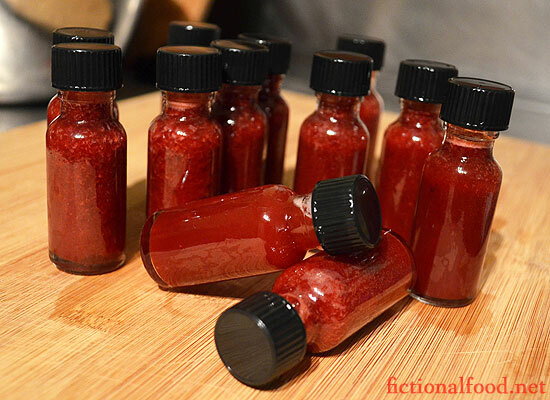 Bottle the blood in glass vials.